Filmmaking, blogging, digital photography and graphics programs are changing the way we use technology to communicate and express ourselves. Arts Horizons’ teaching artists are on the cutting-edge of arts technology and eager to bring their multi-media experience into the classroom to share with students of all ages and levels. Students feel like a professional composer by using industry standard Macintosh computers and the music composition program (GarageBand) that allows even non-musicians to create music. 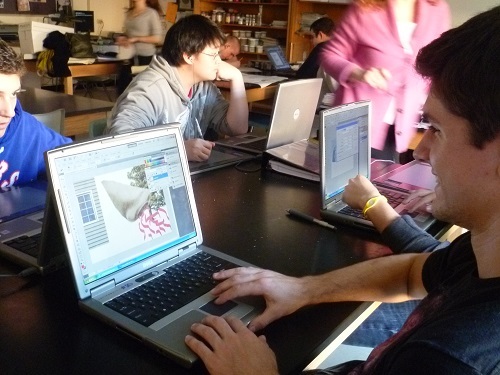 By the end of the residency, each student, or group of students would have a recorded, creative and original music composition of their very own while also learning how to use the Macintosh computer, OSX operating system and Garage Band software. Musical genres available include Hip Hop, Pop, Blues, and World, according to preference and artist availability. School must provide the software. Customized for introductory, intermediate and advanced levels, students learn how a digital camera actually works in a way that is easy to understand. They explore techniques for capturing exciting images using the functions and shooting modes of a digital camera; learning how to choose interesting subjects, lighting, depth of field, composition, transferrin, saving, editing, manipulating and printing pictures. Cameras must be provided by the school. STEM (Science, Technology, Engineering and Math) is essential to the careers of the future. What better way to encourage student participation than by integrating the Arts into the curriculum and transforming ‘STEM’ into ‘STEAM’. Ask our program staff how you can incorporate the arts into your STEM program. This residency requires a planning meeting series with a Math or Science teacher. The virtual world is only a click away! Students can learn 3-D or stop-animation by creating objects, characters and scenes in an easy step-by-step process. Using web and personal imagery, they can add detail, texturing and lighting to render images and tell stories.